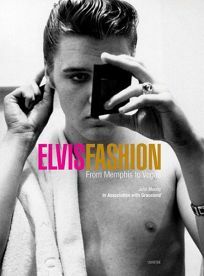 In association with the Graceland estate, music writer Mundy (The Official Elvis Presley Fan Club Commemorative Album) has pieced together the King's many, varied fashions in this beautiful coffee-table volume. Beginning with snapshots surrounding the 1954 release of""That's All Right,"" the photos show a thin, tow-headed (before he began dying his hair) Elvis wearing argyle socks, baggy pants and two-tone shoes; a later spread shows him in fashionable high-waisted pants, a white shirt and a white knit tie. ""Cat clothes are absolutely a must as far as I'm concerned,"" Elvis is quoted as saying. ""My favorite hobby is collecting these real cool outfits, and I'd almost rather wear them than eat."" Of course, while Elvis was always ahead of the country's trends, it's the outfits and costumes from the late '60s and the '70s until his death that truly amaze--including a brown suit with a star belt buckle that he wore at his 1970 Houston Astrodome concert and the flashy white, sequined jump suits that he wore at the end of his career. Pages of large-format photographs take fans through the rebel jeans wearing '50s through the gold lame suit worn on the cover of the 1957 album 50,000,000 Elvis Fans Can't Be Wrong. Rounding out this excellent must-have volume is a CD of last year's hit remix of""Rubberneckin'"" (which also includes Elvis' original recording).